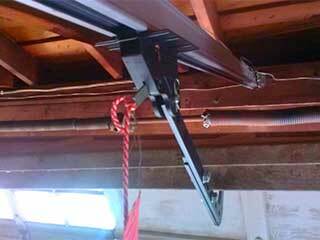 The springs are like the muscles of your garage door system, as they are the ones who physically support and its weight and help it rise and lower as needed. Without these components, opening your door will be nearly impossible, and will require the strength of a few people working together. Obviously, keeping them in a good condition is therefore incredibly important, and our team is here to help you with that. Just like any metallic components that go through a lot of wear and tear on a daily basis, your garage door springs will eventually break. While there's no avoiding it, there is a way to extend their working lifespan, but we'll deal with that later. When the springs do break, trying to replace them without the proper knowledge or the right tools can be terribly dangerous, and you should never try to do this by yourself. Our professional technicians can perform this task for you without compromising anyone's safety in the process. Like we said, while your springs will inevitably break, there is a way to make sure they live up to their full potential. With our regular maintenance service, you'll be able to reduce their wear and tear and increase their efficiency. This will have a double benefit of both increasing the longevity of your springs, and preventing other parts of your overhead door system from sustaining collateral damage when they unexpectedly break. Our technicians will lubricate these components to keep them efficient, inspect them to see if replacing them has become necessary, and perform any required spring adjustment to keep them from overstraining. It doesn't matter if you have torsion or extension springs, if you suspect there's a problem with these crucial components, or you want to make sure they continue to work efficiently for as long as they can, give our team at Garage Door Repair Fort Lauderdale a call. We'll take care of the rest.